Kids Week: Frozen Pudding Pops! You can pick up all kinds of shapes and sizes of molds just about anywhere these days. The ones in this picture are from Target and Walmart. They’re only a couple of bucks too. Totally worth the tiny investment! You can use the plastic sticks they come with, or just buy a bag of popsicle sticks and then you can make multiple batches. I tested a lot of different dairy combos from non-fat milk to low-fat to whole milk to heavy cream. You can choose what you put into these. Just know that the higher the fat percentage the creamier the end product. Don’t go up to full cream though, that doesn’t work so well. My most favorite result was half and half so that’s what I wrote in most of the actual recipes. You can absolutely substitute low-fat milk (or even soy milk if you’ve got allergy issues), it just makes the pops a little icier whereas the half and half obviously makes them richer and more creamy. Also, I used the sugar free puddings, and Jello brand definitely tastes the best. Blend pudding mix, extract, and half and half in a blender until smooth. Stir in crushed cookies by hand. Place in molds and freeze. * I loved Aubri’s idea in the comments- try banana pudding with crushed nutter butters. Yum!! In a blender mix cheesecake pudding mix and half and half until smooth. Add in lemon zest and blueberries and pulse a couple of times to break up the blueberries. Place in molds and freeze. Blend pudding mix, half and half, and almond extract in blender until smooth. Add in cherries and pulse 2-3 times. Stir in chocolate chips by hand. Place in molds and freeze. Blend coconut milk, lime juice, and pudding mix in a blender until smooth. Add crushed pineapple and shredded coconut and pulse a couple of times to incorporate. Add extract if desired. Place in molds and freeze. * the coconut flavor was more mild than I expected. If you want a boost, add a little coconut extract. These might be my 2nd favorite! Blend all ingredients until smooth. Place in popsicle molds and freeze. *Bananas that aren’t quite ripe yet tend to taste especially bitter when frozen, so make sure you use a sweet, ripe, banana. remove stems from berries and pulse with 2 T sugar in a food processor until completely smooth. Taste and add more sugar if needed. You should have just over a cup of puree. Set aside. In a blender combine pudding, yogurt, and milk and blend until combined. Layer or swirl the pudding mixture with the strawberry mixture in popsicle molds and freeze until solid. Okay, you are amazing! I love these wonderful flavor combinations. They are much better than the kool-aid pops I remember making as a kid. Thanks Sara! yum, yum , yum..summer just got a whole lot better!! I absolutely love these ideas. I'll have to give these a try. Wow, you came up with some creative flavors! The mint cookie looks so good, but you definitely have to make the strawberries and cream again so we can try that too! Yum! Wow. They all look delicious! I have no idea which one we're going to try first! Yum! If my kids see this, I'm in trouble!!! LOL!!! Hopefully we can get around to these recipes this summer! At 106 degrees out there…we need some relief! These look delicious! so many fun flavors! I have got to go out and buy some popsicle molds now! Those look soo good. I had no idea you could do so much with homemade popsicles. Thank you! Oh I love these and they don't make the vanilla pudding pops anymore (at least where I live)…will definitely try these. Love all the variations! Ms. Sara, these are too cute! My kiddos are going to think these are the best. I can't wait to try them (especially the mint chocolate one…YUM) Thanks for doing all the creative work and passing it to us! yum.. those mint cookie pops look great! Yum! I'm excited to try them with soymilk so Captain Allergies can have them. Can't wait to try these, they look so yummy! 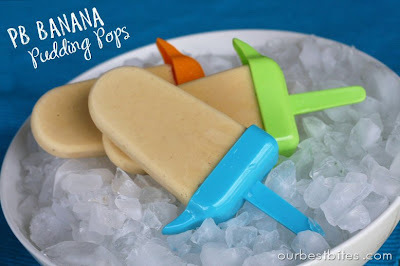 I can't wait to try the pina colada pops! Sar, first, you're amazing. Second, I'm going to be sitting around twiddling my thumbs WAITING for that last one. I know my kids will love that one! 🙂 I'm excited to try it. You are genius! My girls have been wanting to try something like this for a while, I have a feeling these are going to go over well in the Texas heat. Those look so good. I can't decide which flavor to try first. Those flavors are so creative! They are beautiful. I wonder if you could do it with homemade pudding? Jello pudding pops were my favorite popsicles as a kid. I was so sad when they started making them. I found a new version of them at my local Walmart but they just aren't the same. Anyhow, I'm excited to try and make my own. Can't wait to try these. Awesome idea. Easy peasy lemon squeezie. I'm going to try it. Thanks! We just made boring chocolate pudding pops the other day and my boy inhaled his! I wonder what would happen with one of these- thanks for sharing such yummiliciousness! those look great, my kids will love them! Okay these look delish!! Thanks for sharing. If only it were warm enough to have a popsicle here in Nebraska. Mild Summer–booo! This is definitely going to put a good dent in the #10 can of chocolate pudding we've been working on for months. Thanks! Wow…these look so yummy! I just made some pudding pops like the mint cookie ones, except with banana pudding and crushed nutter-butters. You should try those…mmmmmm. Thanks for the new ideas! Yum! These look so easy and delicious. I thought I was being creative a few weeks ago when I made them with a box of chocolate pudding and another of vanilla pudding. These are delicious. Holy cow! Those put anything out a box to shame!! 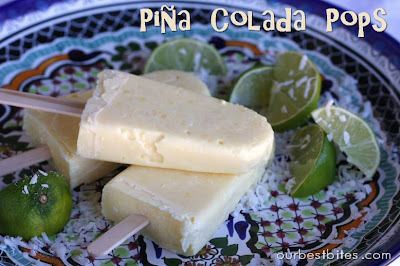 I am ALL over the pina colada pops! I just bought those molds from target! So far I've just filled them with smoothie mix and plain juice. These look like great treats! Am I the only one having flashbacks to the 80's jello pudding commercials with Bill Cosby?! Yum-o! Can't wait to try this with my kiddos! I'm impressed with your creative flavors. When I think 'pudding pops,' I totally see Bill Cosby in my mind. =) Thanks for bringing back a bit of my childhood nostalgia. Yum! There is a local popsicle store here called LocoPops that make gourmet popsicles like these. Now I don't have to empty my wallet there–I can make my own at home. Thank you!!! Those look so good and fun! I am going to walmart to get some molds. Cant wait! these look amazing! My son will be in heaven! 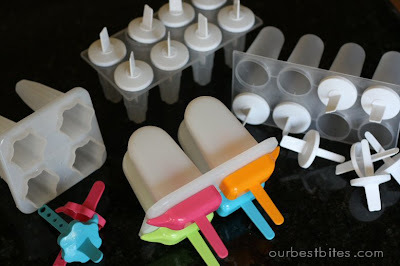 It's amazing to think that we've never thought to do something so delicious with those popsicle molds. Gone are the days of plain juice! These are beautiful. And yummy. Thanks for sharing! Wow! What more can I say! WOW! YUM! my kids… and I will LOVe these! I have only tried freesing boring old pudding, never adding anything else! This is so much better!! THANKS! Gosh where to begin? Maybe I'll just start at the top and work my way through all the flavors…Yum! OMG I really want the Mint Chocolate Cookie Pops NOW!!!!! wowzer!!! Yummy! I can't wait to try them out. These sound like something my kids will really enjoy. Both making them and eating them. And then probably inventing some freakish and hopefully delicious flavors of their own. I lived off banana creamies during the 4th month of this pregnancy and I'm ready for a little variety in my frozen treat selections. These look great! Forget the kids- I want to make these for my husband and me to eat after the kiddos go to bed! These look SO tasty with endless possibilities. I really wanted the strawberries and cream recipe … where is it??? I can't wait to try to mint chocolate! YUM! Wow, these all look so good! I don't know which ones to make first! So cute!! Ah, I am going to try these for SURE! Where is the Strawberry and Cream RECIPE?????? geez ladies….you have really outdone yourselves here!! you know, I have a 2 year old who's a SUPER picky eater. Picky like, he will only eat bread, cheese, macaroni and popsicles. I have been creative in my popsicle making, trying to sneak in healthy things like carrot juice, yogurt, and fruit puree. The little guy can't get enough of the healthy goodness, and I feel ok about him eating 4 popsicles a day!! Never would have thought of the blueberry-lemon cheesecake combo. Brilliant! 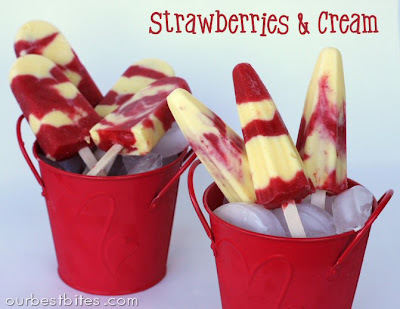 These look yummy, and not to mention perfect for summer! Just bought popsicle molds. You've given me more ideas than I can handle. Must go to store now! Trust me, you are not the only one loosing their mind! These all look amazing! Can't wait to try the pina colada ones! Yum! I'm gonna need to buy more popsicle molds! Or maybe I'll just use my ice cube trays and toothpicks for small portions for my toddler until I can get to the store. I gotta say, the mint chocolate cookie pops look and sound the best. I think those would be my favorite. What a great idea, in general, though. Never would've thought to make my own pudding pops! I may have to try the banana one with chocolate pudding though… I love the combo of chocolate and banana! I can't wait to try these! The possibilities are endless. Thanks! I best be buying myself some popsicle molds. These flavors looks so awesome. These look so great.. I cannot wait to make these when my niece and nephew come for a visit in a couple weeks!! Oh and I will make them for hubby too as he is really a big kid! Kids? I'm going to make these for ME. Oh my goodness! Now the only problem is which one to try first! I'm drooling, these all look so fantastic! I love me some pudding pops and I can't wait to try these! These look so good-especially for a hot day like today. On my way to the kitchen right now to whip up a batch. These all look so good I can't even decide which to make first. I'm going to make the kids vote! What great ideas! Now I need to run out to Target to find the molds!! Yum! I am definitely going to have to try the mint chocolate. I must be thinking in the same wavelength because I posted about pops today, too. My little boy was looking at the pics of the pops with me and he pointed to the strawberry ones and said, "Let's make those." I guess they looked the yummiest. Please post the recipe!! I cannot WAIT to make these! These are great ideas!!!!!!!!! I just discovered your blog a few weeks ago and wanted to tell you how much I am enjoying it! Thank you so much for sharing all of your delicious recipes and ideas!!! Is there a trick to getting them out of the molds? I had to run them under hot water and then they were all metly. Oooh, the strawberries and cream look yummy! Wondering if it would be wrong if I made some of these pops for dinner?!! These all look so yummy! I think adding crumbled up graham cracker crust to the cheescake one would be soooo good! Oh yum!!! I've marked this page to make these! I need to find better pop molds, because the $1 store ones are cheapo junk. The cookies and the cheesecake sounds super yummy! Would love to know how long it takes these to freeze, please. Wow! I am excited for kids week! Thank You! My children will officially love you forever. Mmmmmmmm…I am going to have to run out and buy some of the molds so I can make these! I don't know which one to try first. They all look yummy! If it weren't for my current issues with gestational diabetes, I would make every single one of these flavors!! These look so yummy! Can't wait to spend time in the kitchen with my kids! I know what I'm doing tomorrow… Yummy! Wow! I'm drooling they look so good. Wow, Sara! You outdid yourself with this post. Pudding pops were one of my favorite things when I was little. I wonder why Jell-o doesn't make them anymore. Can't wait to try these! All of those look so good! I'll definitely have to try them! 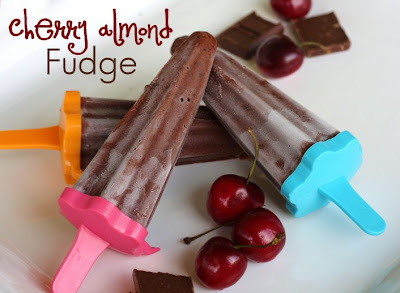 i love making popsicles with yogurt- can't wait to try pudding- even better! I want some of these right now, they look so good! Those strawberry and cream ones look so neat! I am going to load up on pudding flavors next time I am at the store. I have never seen such scrumptious looking fudgesicles in my entire life! I think my husband will be more excited to try these than anyone! 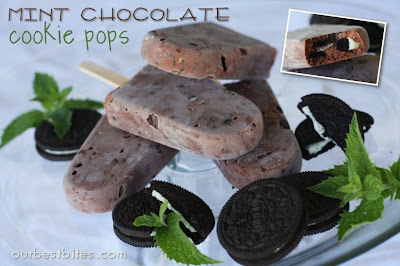 I am all over those mint chocolate cookie pops, and my son will like the strawberries and cream. Thank you, I can't wait to see what you come up with next. yummalicious….is that a word? I am headed over to the big Wally world tommorow to get my supplies. Blueberry lemon cheesecake…. now you KNOW that is for ME! These are soo cute…i think my hubby is going to have a love-hate relationship with those mint oreo ones! P.S. I LOVE that star shaped mold….where did you get that one???? Wow, these look so yummy!!! I was thinking something way less creative when I first saw the title. I will definitely be trying these! Thanks!!!! what a wonderful post! And just in time for our upcoming Bible school. It would be so much fun to make Popsicles with the kids. I love the idea of mint choc and the lemon blueberry. It was just yesterday that I was wondering if they still made pudding pops… now i can just make my own. All of the variations look delicious. These look so good! I can't wait to try them. Um, yeah, are these for the kids? I'm thinking I don't want to share. I am excited to try the PB Banana ones. Those are all such fun combos! I'm definitely going to have to try some of those out! Forget my kids I want to eat these! These look great girls! Good job. i'm making these today! first, i just have to find a mold, and then pudding, maybe a little half and half…. a trip to the store might be in order. I've been wanting to make popsicles this summer. Thanks for all the ideas! My kids love homemade pudding pops. Thanks for the great ideas! Who needs kids for this stuff, I want them just for myself! LOVE all your popsicle creations and my boys would, too! could those look any more delicious?!?! major yum! These look so good! Will have to try this for sure. Thank you! !! I would LOVE to try making the cherry one! These look delicious, easy, and fun! I loved pudding pops when I was a kid. I can't wait to make these with mine. Thanks for the tip. i'm drooling over these…literally drooling! Mint chocolate cookie pops? You must have known me in a previous life!!! OOOH, that sounds so good!! These look completely amazing. I can't wait to make them and impress my family! We made the PB banana ones today.. YUM! i have always loved pudding pops, why don't they sell them anymore? weird. thanks for the recipes! I'm curious, Sara, about why you used sugar-free pudding instead of regular? Would it make any difference to use regular pudding? Thanks for all the fabulous ideas! I can't wait to make these – I might even share with my kids! Got to get myself some popsicle molds! Those strawberry ones look amazing! Yum! I can't wai to try them! You ROCK!! I'm printing now so I can experiment tomorrow! Oh my goodness so many yummy flavors! I can't wait to try some of these, I think I love popsicles more than my kids. I have just been pouring our leftover smoothies in them. WOWIE! What can I say more? These look amazing! I was just telling DH the other day that I need to learn how to make pudding pops! Mmmmmmm! I'll have to try these out! Umm…ok. It's after midnight and my mouth is watering. This does not bode well for my waistline! They all look delish but I'm wondering…how did you store these bad boys? We've never tried these at home but the Oreo ones look incredible and I bet my son would love these! As soon as I saw these, I immediately had to print them off. They just look so delicious. Though, I'm not so sure I want to share them with my kids. . .
You know the way to my heart with the mint chocolate pops. It's not even 9am and already I'm craving ice cream. Yum yum! We just bought 2 sets of molds and have only used koolaid, so this makes me excited about popsicles. Thanks soooooo much. I just made up a batch of the mint chocolate ones last night and I just could not bear to throw away the extra (I only had 4 popsicle molds) so, I did what any sane person would do and ate it….oh man, can't wait for those puppies to get out of the freezer! Simply divine! Lemon blueberry cheesecake is next up! These bring back so many memories of childhood, except mine weren't that yummy looking! These look amazing and I bet they are even more amazing when you eat them! Lucky us that you shared all these fun ideas, experiments, and recipes with us! These look sooooo goood!!!! Thanks for mentioning you can use soy milk!! Oh my! These look so delicious! I can't wait to try them! I don't know if I will want to share them with the kids though! I am really excited to try some of these! Love all the pictures and your blog! I am excited to try some of these–I love all of the variations for the freezer pops! Mmmmm! I am definitely going to try these. So fun and easy! These look so good … my kids will love them! I can't wait to try these. I definitely prefer creamy treats! Oh yeah, I think my kids may like these as well. Those ALL look so good. My mouth is watering just looking at them. I love all the pictures too! I definitely need to go buy some popsicle molds. Oooh, perfect timing! The weather is hot, I'm out of Otter Pops and I'm just planning my grocery list. Plus, I'm tired of giving my kids those sugary pops. I have the molds, but have only done kool-aid or lemonaide. Not nearly as creative (or healthy) as all these yummy flavors! Thanks! I'm loving kids' week! Those look SO adorable! And delicious! I am making popsicles tonight. Oh- and I made the strawberry sorbet recipe for our 4th of July dessert. It got RAVE reviews from the family!! YUM!!! 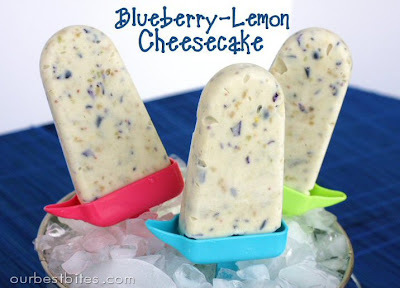 I love pudding pops and can't wait to make the blueberry lemon ones!! cannot wait to try some of these decadent popsicles! yummy! These look amazing. I think they are as much for mommies as for kids. I can't wait to try them. I think we will finally get around to trying these this weekend! Oh my stinking heck! I can't wait to try these! I am stuck in a hotel room in Houston, with no ingredients and no popsicle containers. Thank you again for making such a fabulous post for us to learn from! Oh my!! Those combos look soooo yummy! Those mint pops look so good, I think I know what is for dessert tonight. I've done this before, but I've never thought of all these flavor combos…awesome! How much do I love you for this. Last night I was thinking – I need to make some popsicles, because really, they are expensive and not that good – why can't I make some better ones? I even bought molds. You are inspired. Ok, these look so incredible! I'm totally want to try them all. Mmmmm….If they even taste just half as good as they look! Can't wait to try!!! Yum! My kids will love this! These are something I'll definitely be trying someday when my nieces & nephew are older! I can't wait to make the choc. mint. That is my favorite combo. oh wow, all i can say is yum. i need to go get some fun reusable popsicle containers. What a great idea! I actually made some jello pops – inspired by the new Popsicle brand slow melts – and was dreaming of pudding pops too! Thanks for the great recipes! hey, they look great, but what is "half and half" in one of the recipes? thanks! recette- half and half can be found in the dairy section by the cream. It is a mixture of half cream and half milk. I made these and they tasted divine BUT I had a horrible time getting them out of the molds. Any suggestions? Fancypants (love that name!) – I just run mine under warm water until they pop out. I have noticed though, that the ones with grooves in them- rocket pop style- (like the strawberries and cream ones above) are much harder to get out than the plain round or flat ones, so I just use the plain ones now. I just found your blog tonight and I've been scrolling through the millions of posts I've never seen and my both has literally been hanging open! Thank you for your posts. Fabulous. My kids (shhhh, me too) will absolutely love these. I have chocolate-raspberry-chile pops in the freezer right now. Thought I was all that and a bag of chips until I found these recipes. Can't wait to try these!! Mary, I honestly don't know! I'd have to play around with it to see. But if you happen to first, let us know how they turn out! wow what a great way to cool off in the summer. Just made the strawberries and cream…yum! But I have to ask, how do you get them to come out of the molds so perfectly? I can’t do it to save my life! Heather, I just run them under warm water- but only really quickly. I think some people do it too much and then they end up melting! Do you think fat-free half and half would work as well as the regular half-and-half, or would it make the popsicles icier like low-fat milk would? Both Joann, but if you wanted to leave it out, you certainly could. YUM!!! I have made the blueberry and the strawberry recipes with my daughter and they are easy and delicious. Thanks so much! Seriously, can someone tell me how the popsicles in those pictures came out so beautifully. Mine wont leave the mold. 🙁 HELP! Lol, sometimes they can be tricky! I just run them under hot water and keep wiggling! Its’ a little confusing Kristina, because we’re talking about sugar free pudding, which is 1 oz. Regular pudding is 3.4 oz. They both work fine, so as long as you’re using the small, 4 serving box, you’re good! So, since I’m a sucker for all your brazilian recipes, how well do you think the brazilian lemonade would freeze? These look so good. I can’t wait to try! Thanks for sharing. I’ll post on my blog when I get a chance to try and link to you. I’ve become obsessed with making pops these days…. These make me even more impatient for some hot weather!!! I love the peanut butter banana ones!!!!!!!! I haven’t- but I bet it would be yummy! I’m so excited to make these. Is there a reason you used sugar free pudding other than to get less sugar content in the pudding pops? Just wondering if regular pudding would change the texture or not. I only use sugar free pudding- you can adapt these in many ways. Yummy recipes! I read through most of the comments…can’t find answer to my question…would your recipes work with regular pudding instead of instant? I’d stick with instant Renie! We have never had pudding pops before, so we made the strawberries and creme one with blueberry yogurt. They were delicious! I could of eaten them all myself! Can’t wait to try the others! I’ve had much fun this summer trying many of these recipes with my boys. All hits, I might add. I wanted to thank you for sharing and also share our own recipe (inspired by yours!) We took a small box of chocolate pudding mix and mixed it with 1 3/4 cups milk. Then diced 3-4 regular marshmallows, broke two whole sheets of graham crackers, and stirred them in before freezing for S’mores Pops! They are already asking for s’more! Thanks again! Can I use and electric mixer? Just ask the produce department- they usually keep the over-ripe bananas in the back! how can we print out the recipes without having to print the entire comments etc. C.
I just fixed it for ya Connie! You should now see print boxes around all of the recipes. I want to make these, but only have the large size boxes of pudding on hand. Any idea what the conversion would be for the rest of the recipe. Unfortunately, the large size is 5.1 ounces, so not a simple doubling of the small 3.4 ounce size. You’d have to get out a kitchen scale and weigh out 3.4 ounces- I’ve done it many times! I wonder if using greek yogurt for the dairy? Or greek yogurt + skim milk?